Writers are taught that details matter, and that they should be sure to include lots of them in their stories. But that advice can be taken to an extreme, and as evidence we have this 1970 science-fiction novel, which time and again is bogged down by tedious, nonessential detail. Stephen King in his nonfictional On Writing had better advice when he said that a writer can evoke almost any setting by using a few vivid, well-chosen details, and then letting the reader’s imagination fill in any gaps. It’s too bad Finney didn’t heed that advice, because the concept of his novel, in which a lowly graphic artist is recruited for a top-secret time-travel experiment, is a fun one. But Finney’s obsession with describing every horse, buggy, building, and snowflake on the streets of 1882 New York makes reading most of this book a chore. 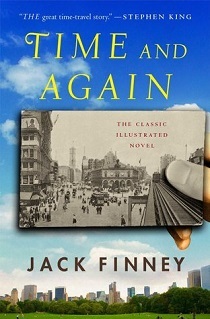 Time and Again finally springs to life about three-quarters into the story, when Finney abandons his love affair with descriptive passages and turns his attention to characters and plot, at which point the novel turns charming and entertaining. I’m just afraid that many readers won’t make it to that point, having long since decided that the preceding sluggishness is a waste of their time.